Season two of the newer, hippier Sherlock Holmes recently premiered on PBS Masterpiece. Fans know that this version of Sir Arthur Conan Doyle’s private detective isn’t your great-great granddaddy’s Sherlock. Instead, Holmes and Dr. Watson are investigating mysterious crimes in contemporary London, with the gadgets and technology we use everyday. This Sherlock also has a surefire way of generating new business: blogging. The first episode of the second season features a montage of potential clients coming to Sherlock to solve their mysteries after discovering a blog maintained by Dr. Watson. Holmes: Do people actually read your blog? Watson: Where do you think our clients come from? Holmes: I have a web site. Watson: ...nobody's reading your web site. That’s right. No one is reading your website. They’re visiting for the blog posts and downloadable eBooks, whitepapers and case studies that are entertaining, informative or both. But that’s not all we learn about inbound marketing from Sherlock Holmes and Dr. Watson. 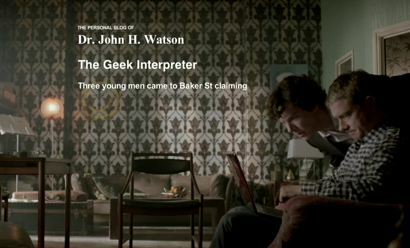 While Sherlock’s website tells visitors what he does, Dr. Watson's blog tells visitors how he does it. Watson is a storyteller and creating an entertaining narrative around The Hounds of the Baskerville or The Blind Banker keeps people coming back to the blog. Sherlock Holmes and Dr. Watson become Internet sensations that not only bring in new clients, but also get the attention of the press. Through blogging, Dr. Watson has managed to build Sherlock’s reputation to the point where print and television news outlets amplify his reach. Sherlock Holmes is the ultimate lead qualifier. While Watson’s blogs bring in potential clients, Sherlock shoots many of them down... even a guy who says he’ll pay any sum of money for his services. He knows his business plan, as well as what clients are worth having in his portfolio. At one point Dr. Watson shows Sherlock that 1,895 people visited the blog in just eight hours. Watson’s not shy about showing the boss how important it is to the business, even saying, “This is your livelihood.” And for many businesses, inbound marketing is just that. Want to know more about blogging? Download our Blog Post Optimization Playbook.